Including international and area code. Apply Our Affiliate Program NOW! If you've got a website, blog or forum dedicated to motorcycles, ATVs or any other industry-relevant topic and if you are looking to earn extra revenue from your website - apply today! With a well-known and trusted brand, we offer a real opportunity to earn money from your website. 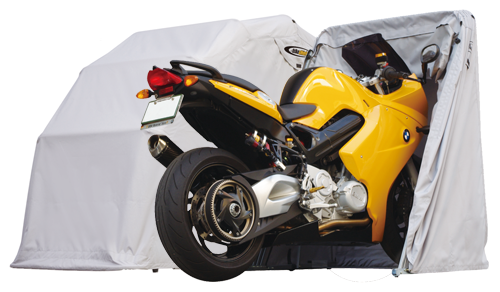 We have been a top seller for more than 10 years as a self-enclosing motorcycle shelter / garage / cover in the overseas major market. We have started promoting the Bike Shield in North America since 2015 and already received the highest rating at Amazon and other customer reviews. • An average order value of over $300. • Two “peak” sales seasons annually (the spring/summer riding season and the holidays). • 30 return days (cookie). • Real-time traffic and commission monitoring. • A dedicated affiliate manager. When you join our affiliate program, we'll supply you with banners and text links you can place on your website, social media links, and outbound emails. When a user clicks on one of your links, they will be brought to our website and their activity will be tracked by our affiliate software. When a purchase is completed from the traffic you send us, you earn commission! *It's easy! Just sign-up on our affiliate program above (We will evaluate your site for content prior to approval). You will find a variety of text and banner links to choose from. Place the links on your site and you are ready to earn commissions on all sales referred by your website. The Bike Shield pays 10% flat commission on sales referred by your site, depending on your monthly totals. The Bike Shield may offer periodic promotional or incentive commission rates for feature placements or email promotions. Simply complete the "Affiliate Request Form" on top and click 'Sign Up'. If approved, we will create an affiliate account for you. Once this is done you will receive your login details and be able to begin earning at once!